Let’s admit that we are all living in the world of big ambitions where experiencing something is not complete without telling the world about it. If you are one of those people who finds it hard to enjoy a great moment without taking a selfie or posting on Instagram, then you’ve come to the right place. Iceland is one of the most photogenic destinations in the world. 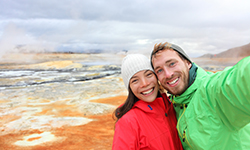 Its icy glaciers, active volcanoes, awe-inspiring waterfalls, eerie hot springs and deep fjords provide many opportunities to indulge in the modern trend of selfie taking. It is almost impossible to take a bad shot as you travel from stunning views to astounding landscapes in the Land of Fire and Ice. The Iceland Selfie Marathon is the perfect trip for those who are big on ambition but short on time. This speedy journey around Iceland will have you ticking off bucket list items faster than you can say “Group selfie”. Take in all the major highlights and some tucked-away gems of this fabulous country. Let’s go … and tell the world - been there, done that, got a T-shirt! We know, you will be back. Note that the total mileage is 1.700 km / 1.054 miles, which makes this tour suitable for travelers who like to see as much as possible in the shortest possible time and don’t mind traveling long hours by minibus. It is a Thunderbolt Sprinter, named after Thor, the God of Thunder and Usain Bolt, the best sprinter in the world. That’s about as fast as we go, making the Iceland Selfie Marathon the fastest guided bus tour around Iceland – in the speed of Thor’s Thunderbolt. You visit over 20 must-see locations; often quick photo stops at each location with a couple of walks and hikes here and there. There is free Wi-Fi on board. If you prefer a more leisurely schedule, we recommend our 8-12 day tours around Iceland. Early morning departure from Reykjavík bus terminal for the first 500 kilometres of our express tour around Iceland. The first stop is in the town of Borgarnes (10 minutes), located in West Iceland, and followed by a hike on Grábrók volcano crater (40 minutes). You have one hour to explore Akureyri, the capital of North Iceland. Goðafoss waterfall is a beautiful site to shoot a couple of selfies (10 minutes) before we reach our overnight location in Húsavík. Estimated arrival time is 20:00. The speedy tour around Iceland continues driving along beautiful fjords and past small fishing towns in East Iceland. Today’s mileage is about 400 kilometres. There’s a stop in the charming town of Djúpivogur (20 minutes), a one hour lunch break in the town of Höfn followed by 90 minutes to explore Jökulsárlón glacier lagoon by boat among floating icebergs. It is again selfie time at Svínafellsjökull glacier tongue (20 minutes) before we reach our overnight location in Southeast Iceland. Estimated arrival time is 19:00. The last day of our quick-but-quality journey around Iceland is full of highlights as we drive about 400 kilometres along the South Coast and the Golden Circle route to Reykjavík. The first stop is in Vík (20 minutes), Iceland’s southernmost town, followed by another 20-minute photo extravaganza on the black lava beach of Reynisfjara. Say “group selfie” at Skógafoss waterfall (10 minutes) and one more time at Seljalandsfoss waterfall (10 minutes). In the afternoon we reach the last waterfall of the journey at Gullfoss where you have 20 minutes to admire one of Iceland’s most famous nature sights. Two more 20 minutes stops: first at Geysir geothermal springs and then at Þingvellir National Park, a UNESCO world heritage site. Estimated drop off time at the Reykjavík bus terminal is 19:00. PRE & POST NIGHTS IN REYKJAVÍK: Not included in this tour program. 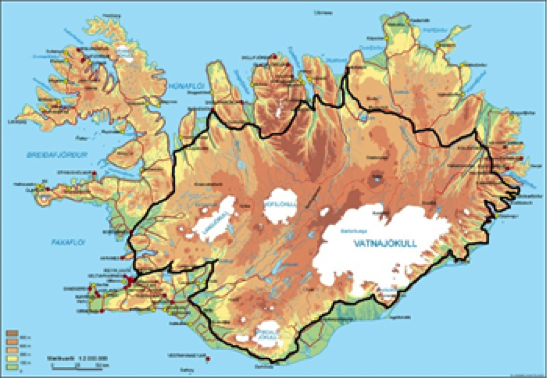 Note that the Iceland Selfie Marathon starts and ends at BSI bus station in Reykjavík. No hotel pick up/drop off available. Pre & post nights and airport transfer between Keflavík and Reykjavík need to be arranged by you, the booking agent, or by the traveller directly. AIRPORT TRANSFERS: Not included in this tour program. Note that the Iceland Selfie Marathon starts and ends at BSI bus station in Reykjavík. No hotel pick up/drop off available. Pre & post nights and airport transfer between Keflavík and Reykjavík need to be arranged by you, the booking agent, or by the traveller directly. If you like to have more time to explore Reykjavik, then we suggest adding a pre- or post night in Iceland's capital.